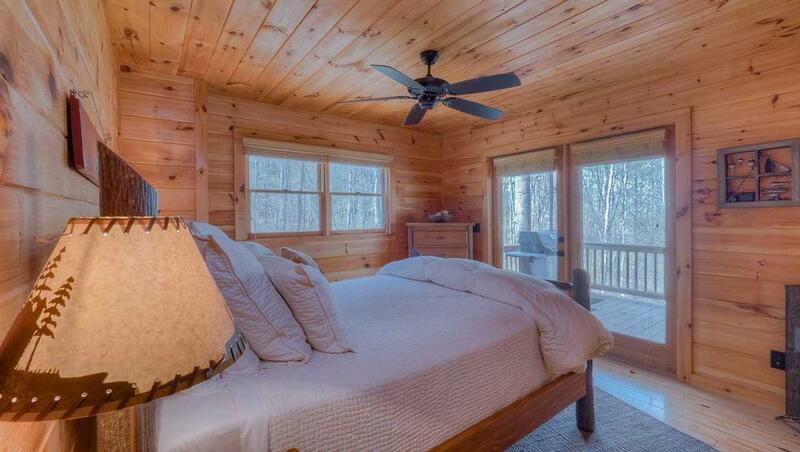 White Tail Crossing is a decidedly romantic, two-bedroom cabin sitting perfectly at the crossroads of luxury and serenity. 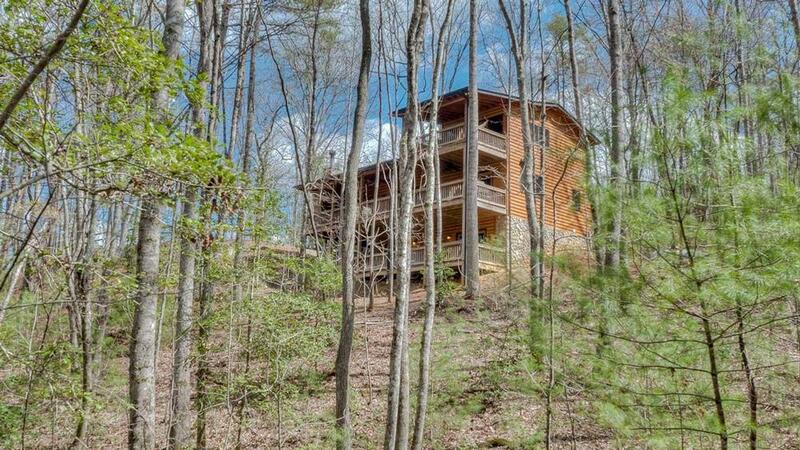 Situated in the Aska Adventure Area close to all that is Blue Ridge, the home has magnificent wooded mountain views. 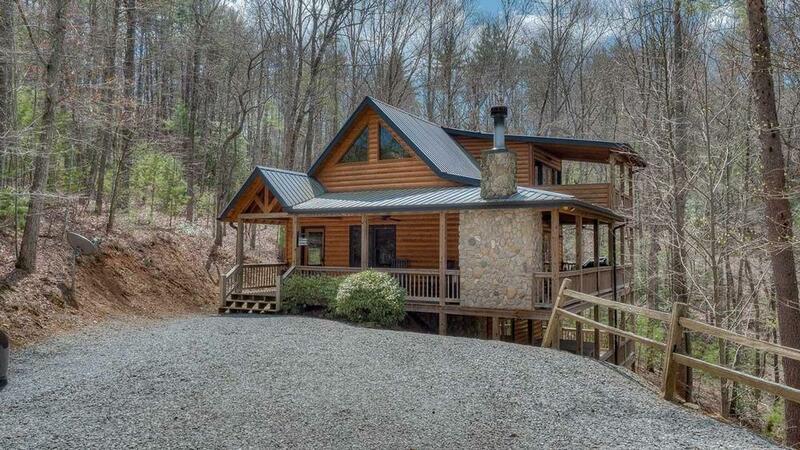 You will understand the inspiration for the cabin’s name, as the close by Toccoa river’s gentle current bids refreshment for timid deer and resident bunnies. White Tail Crossing is a meticulously cared-for home with beautiful granite finishes, stainless steel appliances and a wonderful array of amenities. The ultra comfortable couches are the perfect place for book-reading or watching your favorite guilty pleasure on high-quality, flat-screen televisions. A lower level gathering/game room also offers Wii gaming and a high-end home entertainment system with Bose surround-sound systems. The music also fills the air around the home’s generous deck through a five-speaker outdoor sound system with IPOD and docking. As your favorite melodies swirl, you can turn up the relaxation sitting in over-sized rockers in front of a beautiful, outdoor wood-burning fireplace. 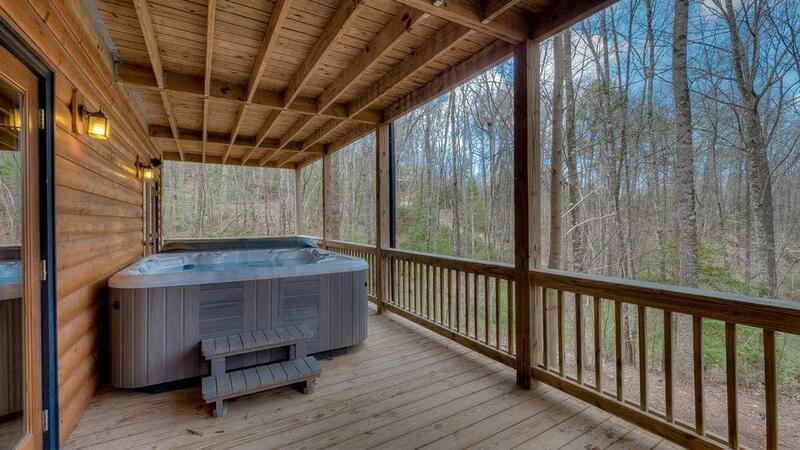 The outdoor living is as idyllic as the views and a nearby six-person hot tub and plenty of deck seating welcome you to take in the ambiance. 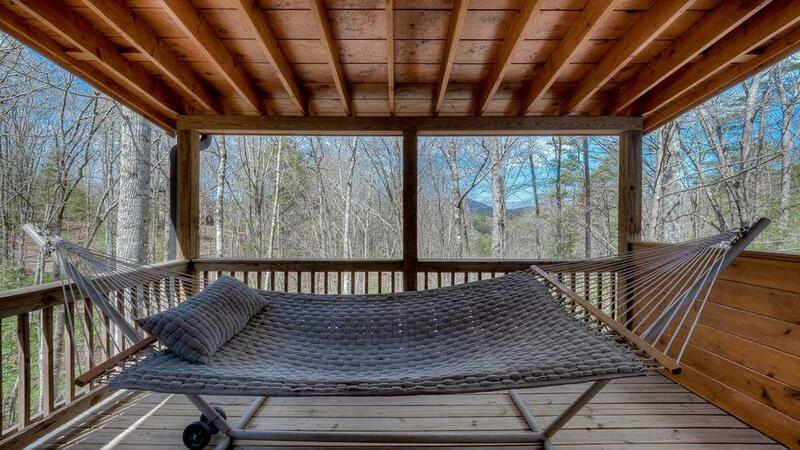 Meditative moments on a hammock off of the master bedroom overlooking Rich Mountain provide a perfect first course to relaxation. Yet, the most delicious rest awaits you in the queen-sized pillow-top master canopied bed with high thread count bedding and silky linens. The second bedroom is outfitted similarly with an equally comfortable queen sized bed and both rooms have their own private and luxurious bathrooms. You will appreciate the details at White Tail Crossing and reconnect with yourself - or your loved one - in comfort and with contentment. 03/19 - We loved the views from the cabin. 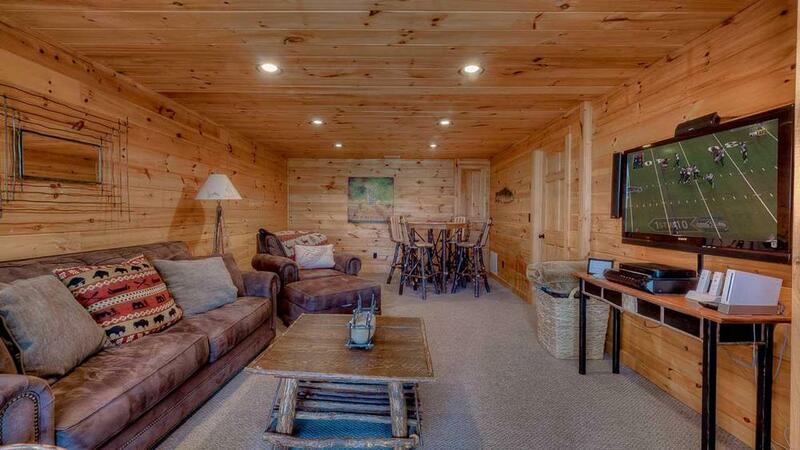 The cabin was spacious and we enjoyed the basement entertainment area. It was conveniently located to downtown Blue Ridge. 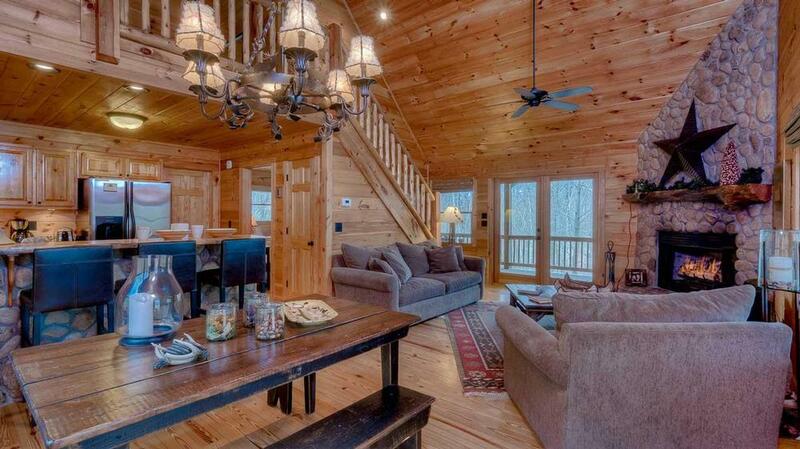 We have rented from the company many times and have never had a bad experience in any of the cabins we have rented. 02/19 - We liked the layout and warm, quiet design. I've used Escape to Blue Ridge before. I would definitely recommend. 01/19 - We really enjoyed both the indoor and outdoor fireplaces. The upstairs master bed was very comfortable and had very comfortable linens. All of the staff of Escape to Blue Ridge that I had any interaction with was very courteous. 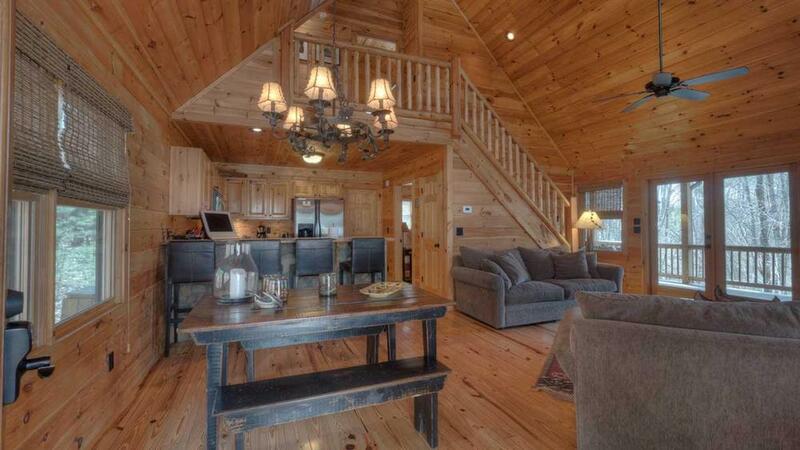 It was very easy to make reservations and everything was ready when we got to our cabin. I would definitely book through your company again. 01/19 - Enjoyed the hammock adjacent to the master bedroom and the hot tub. 12/19 - Location close to town was good and quiet. Fireplaces and porches were wonderful. Love the company. Have had nothing but a great experience with office staff and reservations. 11/18 - Easy to get to the cabin, loved the outside fireplace and the hot tub, very relaxing. The cabin was very clean and comfortable.Great company!!! Rented many times and never a problem!!! 12/18 - Loved the fireplace on the porch!!! Great company, have rented several cabins from you and they have always been exactly as described on your website. 4/18 - Perfect size home for a couple/two couples. Very clean and comfortable. Perfect location..close to everything. Hot tub was awesome! Love renting from you and will do so again in the near future. 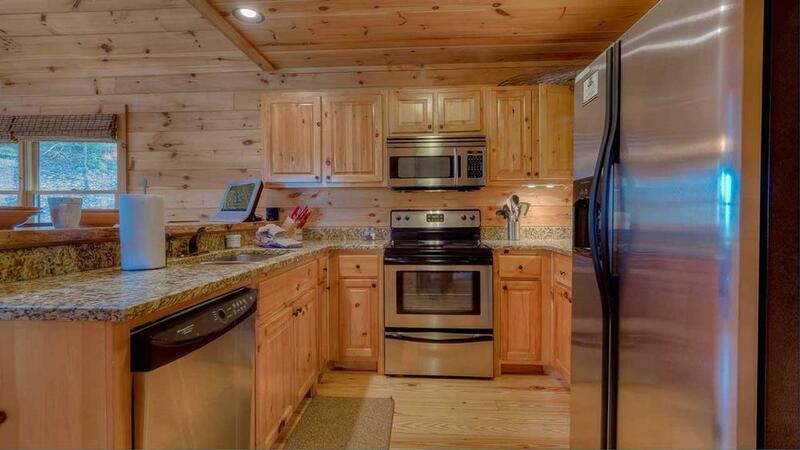 Comfortable bed, wonderful porches, well stocked kitchen. Very efficient and friendly. This is the second time we’ve rented. Thanks for your attention to all details. 3/18 - The bed was comfortable and the cabin was clean. The furniture was comfortable as well. The interactions with the company were positive. The little care package was a nice touch. 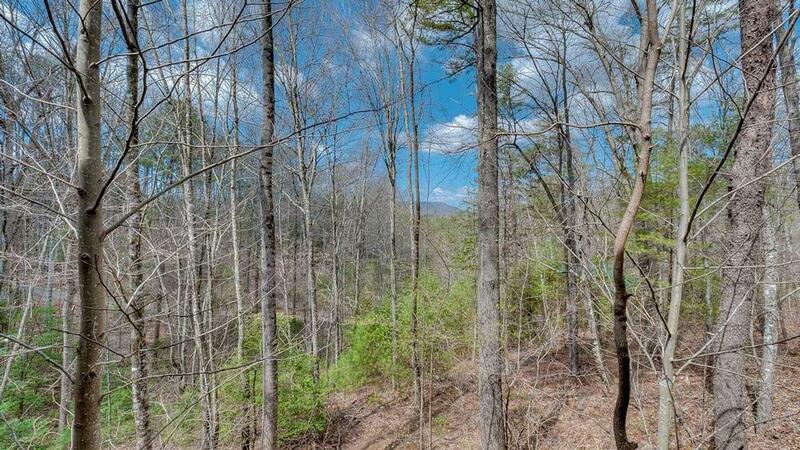 08/17- Private wooded lot, quiet, nicely decorated and equipped. This is the 3rd time I've rented through Escape to Blue Ridge. Every interaction has exceeded expectations - friendly knowledgeable staff who are very helpful. 06/17- Took a long nap in the hammock, it was great! Hot tub was awesome! Loved the mountain decorÌ¡åÙå÷å_. Great company, this was a last minute trip and I just called and it was booked and we had directions in less than 30 minutes. 06/17- Love the home! The set up was great and we had everything we needed to enjoy our time there. Great company, already recommended to friends. 04/17- Very clean and decorative cabin. Lots of space and beautiful area to relax. Great company. Always available for questions and made making reservations easy and simple. 12/16- The cabin was wonderful; just as described. Loved the view and the decor and overall we felt like we were at home. So comfortable and welcoming. Great communication and service. Would definitely recommend Escape to Blue Ridge to family and friends. 09/16- The home was clean overall and decorated very nicely. We would go back and stay there, we loved it. Everyone that we came in contact with was super nice and polite. All of the staff was so accommodating and gracious. We were very pleased and will use Escape to Blue Ridge again. Thank you so much. 09/16- This is a very cozy cabin. When reserving the cabin the staff was great and very helpful. 02/16- Beautiful view from the back deck. Spent the whole day by the outdoor fireplace with a good book. Comfortable beds. Perfect for a weekend getaway for 2 or 4. I trust that we are staying in a clean, well-maintained home. I like knowing that I can call any time if something goes wrong. 02/16- Very nice home with wonderful views. Perfect for romantic getaway! Cabin was clean and well stocked with clean towels. Staff allowed us to stay longer due to snow and ice on the roads! Thank you! Already planning another trip in the spring or fall. EBR had great communication and were a pleasure to deal with. 11/15- Our favorite features were the outdoor fireplace, theater room, hot tub, luxury furnishings, cleanliness and look and feel of being in a mountain home. 10/15- The home was beautiful, had everything we needed for an enjoyable stay. Great location,quiet and was not difficult to get to, great directions! 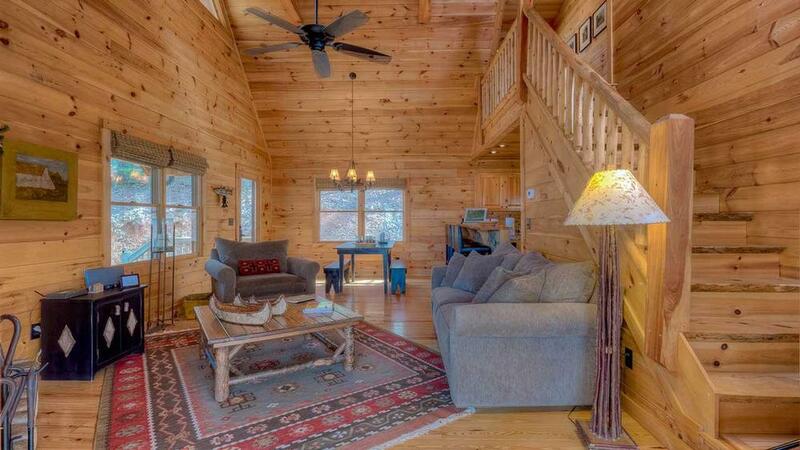 Love Escape to Blue Ridge, have used the company for the last several years. Will definitely recommend to others. 10/15- Cozy, lovely cabin. 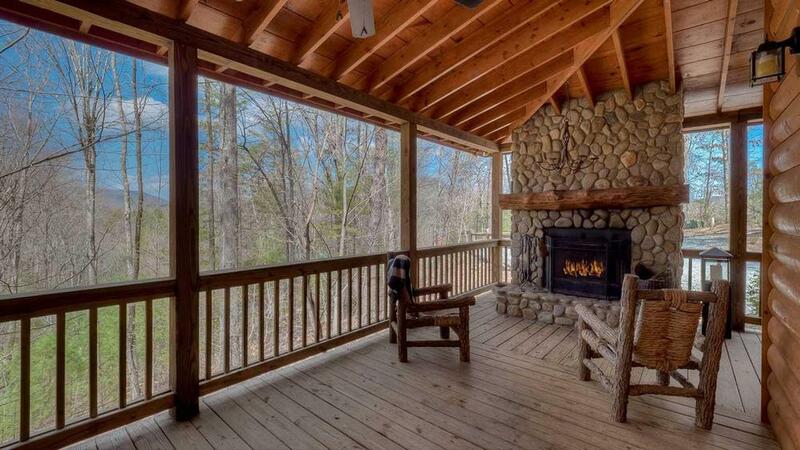 Really enjoyed the outdoor fireplace and porches. Relaxing atmosphere and comfortable. 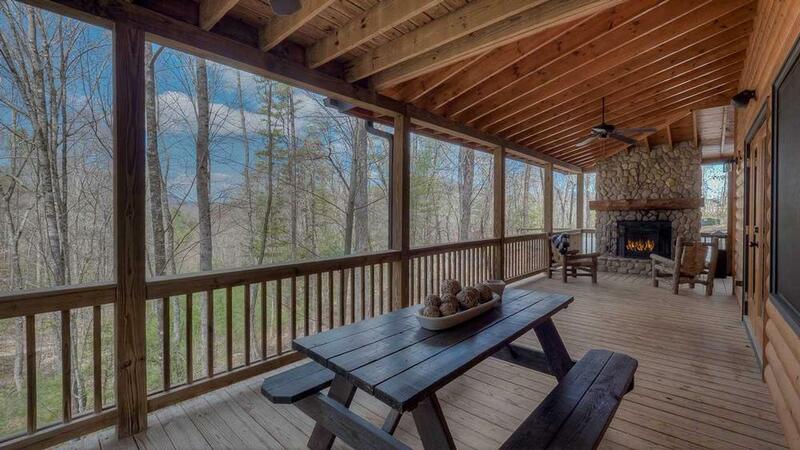 I will definitely book through Escape to Blue Ridge again. 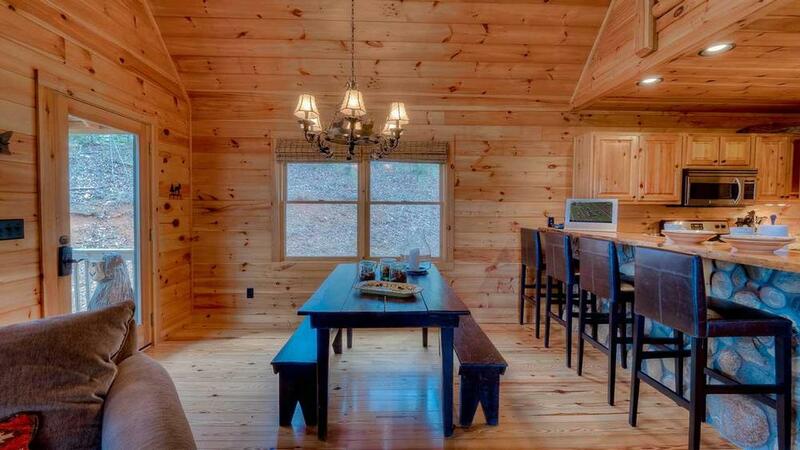 The process of renting a cabin was easy and efficient. Love the website where it is easy to see availability for each cabin, along with all the details of each property. Truly Great!! 10/15- Very cozy, welcoming and had everything we needed. The towels and bedding were good. 09/15- Cleanliness, comfort of the beds, home theater system, rocking chairs on the porch. 06/15- I loved the solitude, the convenience of having most everything I needed, and the freedom to come and go without having to keep up with a key. That was really nice. 05/15- We loved this house and didn't want to leave. The outdoor deck was our favorite spot. Every morning we enjoyed drinking tea and sitting in rocking chairs and sitting near the fire. We loved everything about this house. SO CLEAN and the little touches to make us feel comfortable. It was perfectly decorated and so comfortable. Perfect location to everything we wanted to do in the area. We can't wait to come back!! 03/15- The home is really beautiful and well equipped. Very comfortable and well insulated, which we noticed because it was really cold this weekend! We will definitely come back! 03/15- Loved outside fireplace. View of the mountain. Decor....very well-kept. The cabin was extremely well-kept and nice the service was perfectÌ¢åÛå_ Nothing but positive things to say. 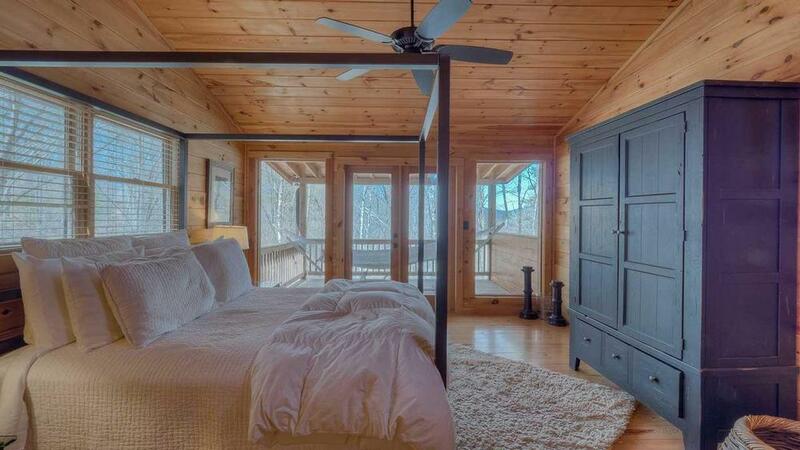 03/15- My fiance and I loved the bedroom, particularly the view as we awoke each morning. The downstairs media room was also exceptionally warm and inviting. We had an experience that absolutely surpassed our already high expectations. I was bothered but once, when it was time to leave. 02/15- privacy, tranquil, cabin was amazing for a private setting with loved ones. The company itself is true to what they say you are walking into without the knowing. That starts the trip in a truthful positive way. then the mountains/environment.. it is a taste of reality without every day life. As if your true self comes about in this beautiful, tranquil, un materialist world. It is amazing and a get place to reconnect with family and from life's challenges. Plus an inexpensive way to enjoy!!.. 01/15- Everything was fabulous! Stunning decor and views! We loved the outdoor fireplace and jacuzzi tub. We had a fantastic experience! All instructions regarding cabin access and directions to the cabin were emailed in a timely fashion and were easy to follow. The amenities were wonderful and we will definitely recommend Escape to Blue Ridge to our friends and family. 11/14- We loved the fireplaces and the hot tub. And how clean everything was! The whole house was decorated beautifully. 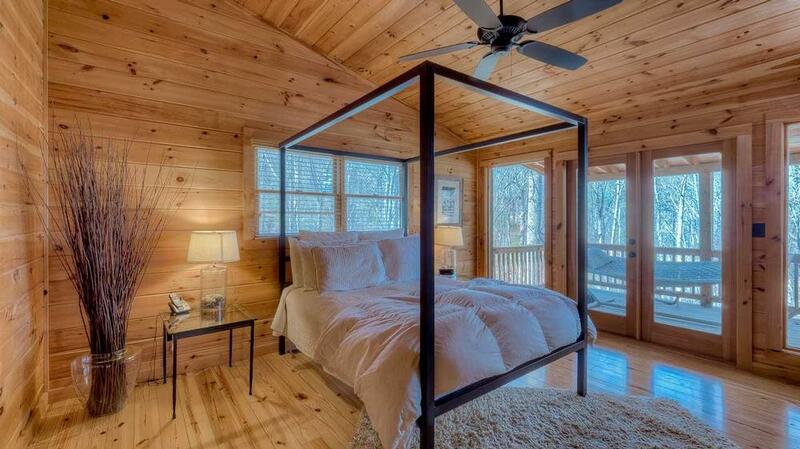 A great cabin getaway! 09/14- This was our 2nd visit to White Tail Crossing. 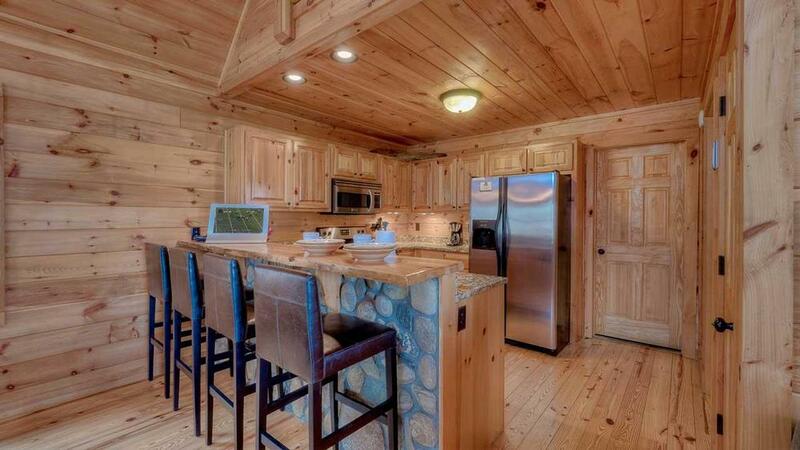 We love the open floor-plan of the cabin. 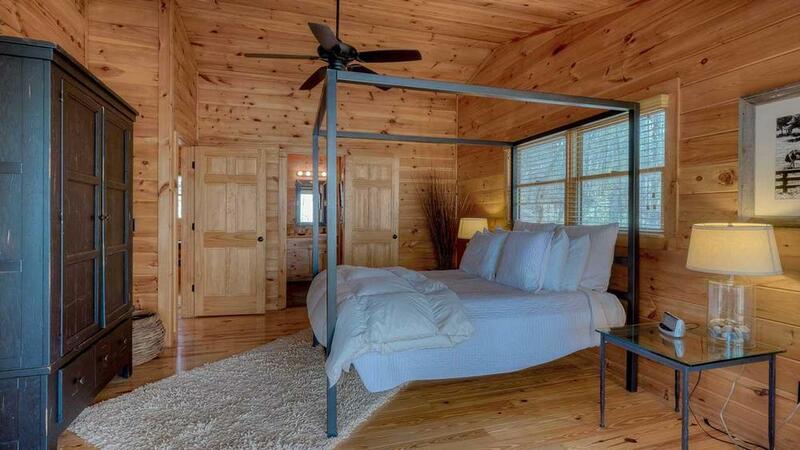 It is set in quiet and rustic surroundings, yet the home is tastefully decorated and very clean and comfortable. 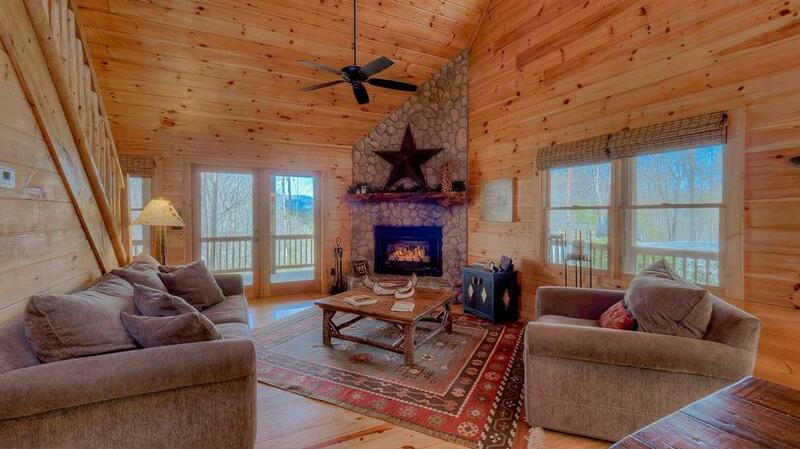 We enjoy the many amenities that this cabin provides, especially the outdoor fire place, hammock, and the jacuzzi. I have only stayed at White Tail Crossing, and it is immaculate and beautiful. 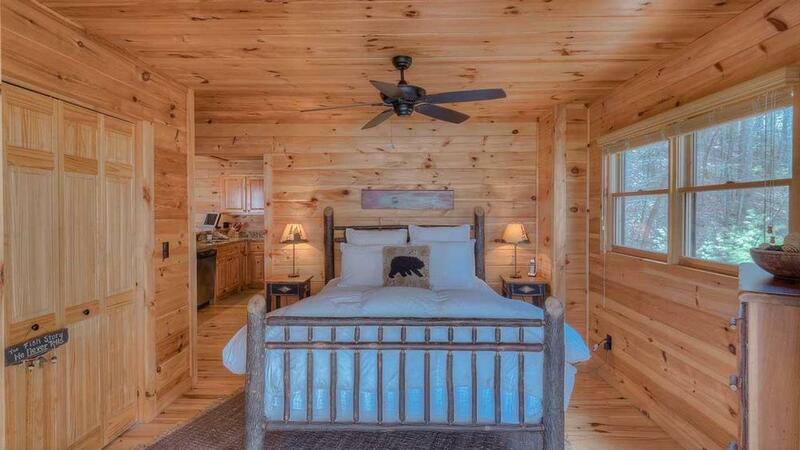 If all of your cabins are as lovely, we know others would be just as wonderful to stay at. 09/14- welcoming, spacious, and clean - location. Would return and have already recommended Escape to Blue Ridge to others. 08/14- I loved the feeling I got when I walked through the front door. The welcome gift was a nice touch, but I felt like I owned the cabin. You guys are very friendly and in touch with your customer's needs. 07/14- Loved netflix on demand, cozy throw blankets, & the hammock! We had a wonderful time. The cabin was beautiful! We will come again and tell our friends about it.